Rolien Brown Brogden, 88, passed away peacefully on November 12, 2018. Rolien was born in Knoxville, Tennessee on March 12, 1930 and was raised in Tazewell, Tennessee. She graduated from Claiborne County High School, then attended Tusculum College in Greeneville, Tennessee. She married Frank Brogden on December 30, 1950 and graduated from Tusculum in 1951. After moving to Kingsport, Tennessee, Rolien began a teaching career in the Sullivan County School System. She took a break from teaching to raise four children, then resumed as a teacher at Long Island Elementary School, and finished her career at Brookside Elementary. 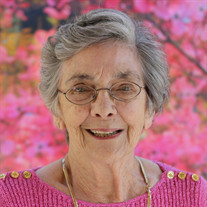 In addition to teaching, she was an active member of First Broad Street United Methodist Church, cooked for Meals on Wheels, served with Contact Concern, was a member of the Delphian Club, and was a sustaining member of Kingsport Junior League. She was famous for her wonderful and abundant meals for family gatherings, which she prepared and served with grace and ease. She was an avid knitter and seamstress, and in her later years she enjoyed spending time with her beloved grandchildren and great grandchildren. Rolien was preceded in death by her parents Robert and Anna Brown, son Reid A. Brogden and husband Frank M. Brogden. She is survived by son Bob Brogden of Auburn, Washington; son Russ Brogden and wife Joyce of Kingsport; daughter Kathryn Allen and husband Ron of Knoxville, Tennessee; nine grandchildren, and seven great grandchildren. A memorial service will be held at 2:00 p.m. on Friday, November 16 in the First Broad Street United Methodist Church sanctuary. The family will receive friends in the Fellowship Hall following the service. The family requests that memorial contributions be made to The Alzheimer's Regional Resource Center, Inc. 2303 N. John B. Dennis Hwy. Kingsport, TN 37660.